Nov. 15th to March 14th, 2014. Extended to April 5th, 2014. Opening Reception: Nov. 15th 5-8pm. Closing reception: April 5, 12 noon - later. 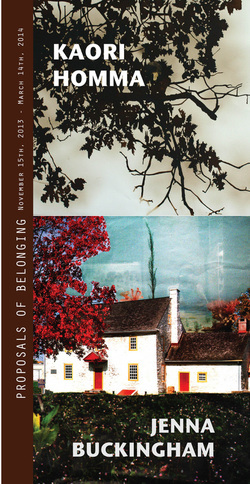 “Proposals of Belonging” brings together Jenna Buckingham (Philadelphia, PA) and Kaori Homma (London, UK). A focus on geographical boundaries and related crossings and transitions has propelled these two artists into new bodies of work, which share a preoccupation with ways in which we situate ourselves in the world. “The creation of home is desperate,” writes Jenna Buckingham, whose experiences of cultural and geographical displacement early on have sent her on a life-long search for home. For Buckingham, now based in Philadelphia, making art serves as a way to connect – to material, to memories, and ultimately to others. Her constructions, teetering between sculptural collages and theatrical sets, are poetic and jarring reminders of our complex relationship to space and place. Homma has created a new body of work, Terra Incognita, as a direct response to her visit to Street Road in 2012. This group of works draws on her early, acculturated, experiences of the western Chester County landscape as a girl who came to know these spaces through books in a Tokyo public library in the 1970s. Homma still recalls the Wyeth vision of the world as a primary landscape in her head beginning back then, despite the fact her experiences were a world apart. The Terra Incognita series explores the artist’s interest in the blending of personally experienced landscapes and thosewe know through art and popular culture. Together, Homma’s and Buckingham’s interdisciplinary explorations linger in the space as “proposals for belonging”- a phrase borrowed from Buckingham’s practice - and extend Street Road’s commitment to questioning the nature of place, both as a changing geographical reality and as a shifting cultural and psychological construct.